Are you ready to start your next automotive adventure? Audi Wilmington, your Audi dealer in Wilmington, DE, will be here with you every step of the way. In fact, we make it our mission to provide all the services you need for a happy and long life of Audi ownership. How do we do it? It all starts with incredible customer service. We proudly serve Wilmington, New Castle, Newark and Dover, DE, Chadds Ford, PA and West Chester, PA, with all their Audi needs. Drivers choose Audi Wilmington due to our extensive inventory of new and used Audis. 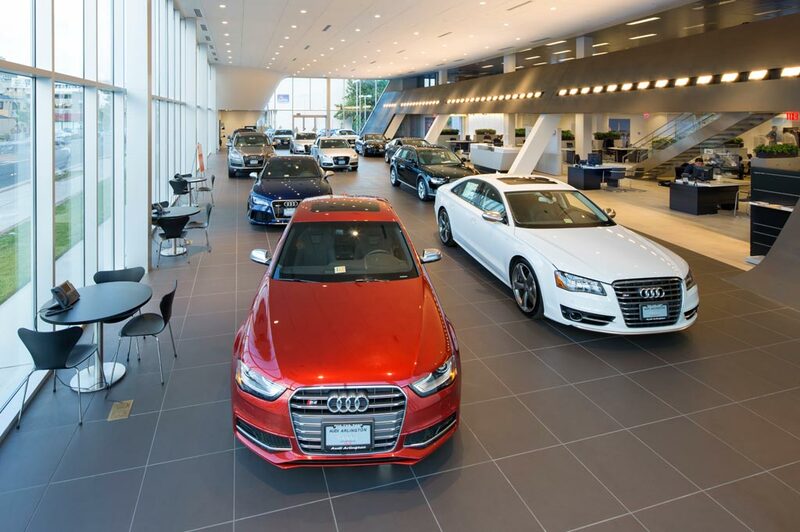 Stop by our state-of-the art Audi showroom and see why we are Wilmington, DE premier Audi dealer. At your Audi dealer in Wilmington, DE, your happiness is our priority. That's why we make your shopping process as easy as possible. Whether you're looking to purchase a new, used, or certified pre-owned Audi vehicle, you can find everything you're looking for in one place. Our online inventory tool is easily searchable, easy to use, and up to date. You can see all the vehicles we have currently available in one place and at a time that's convenient for you. Available 24/7, our online showroom makes your shopping process super easy. When you're ready to take the next step in your journey to Audi ownership, our friendly team of sales professionals will be happy to work with you in our Wilmington showroom to guide you through the next steps. We'll help you get all the special features you want at a price that fits within your price range. And we'll do it all with a positive attitude in a relaxed environment so you can just enjoy the ride. The last thing you want to think about while shopping for your luxury vehicle is the finances, which is why our team does everything possible to make this part of the process as easy as possible. It all starts online with our secure financing application. Apply for a car loan online and our Wilmington, DE, Audi team will take it from there. We'll work with you to ensure you get the best car loan financing terms available by reaching out to our contacts in the business. We'll also look for Audi model specific financing specials and deals and offer the best of everything that we can. In addition to financing, we offer extended warranties that could save you time and money in the long-run. If you're not interested, we won't push. At Audi Wilmington, we want you to enjoy every moment of your car buying experience. In addition to vehicle sales and financing, we offer a full-service automotive maintenance and repair department where we'll take care of all your vehicle's needs. From oil change to transmission repair, we do it all. And we make that process as easy as possible, especially considering your busy schedule. Schedule a service appointment online in Wilmington, DE, and a highly trained team of technicians will get your Audi back on the road in no time. The team at Audi Wilmington works hard every day to ensure that all your automotive needs are met and that you have nothing to worry about. If you're in the market for a new or used Audi near Wilmington, DE, Chadds Ford, PA or West Chester, PA, look no further than Audi Wilmington. Start shopping through the online inventory at Audi Wilmington now to get started or visit your Audi dealer in Wilmington, DE, today!